Just found this thread. Looks like you are building a quality layout. Great looking trackwork. Looking forward to following your exploits!! Finally some time waiting for paint to dry. Summer has been busy, and hot, but I've still got some useful progress to show. I built a shoofly at the W. end to connect the east runner with my old loop, so I can at least run out-and-back. I finally got my bundle of M-E weathered code 83 rail (8 months), so I could finish the crossover from the WB main to the westerly running track. And then I started the yard during the month I spent thinking about switch controls and the main line panel layout - Three quarters of the reason this layout goes so much slower than some others is that every !%&$# thing turns into a design project, and while I can do design, it would be a thin living at the speed I can manage. After considering the simple push-pull rod scheme, I settled on more of Humpyard Purveyance's switch levers. But I'd never used them in association with a block panel before, so I spent longer than I like thinking about usability, access, hand clearance etc. If I wind up using slide switches for point contacts, I'll need to modifiy the cable clamps to hold the cable sheath better (and I've worked out a better way than I used for the Bexley yard). But that's for another post. I was happy to see that you are using Humpyard Purveyance controls. In case you haven't seen it, here is a pic of what I have at both ends of my passenger terminal. I have yet to finish the building but I think it is going to work out well. I really like the controls. By the way James, where in New Hampshire do you live? My sister lives just outside Keene in a house built in the late 1700s. I just love New England! I'll have to remember that mounting, if I wind up with a place where a building can hide it in the next phase. For my Bexley yard, I left an open slot between the engine terminal levers and the yard body levers, and it makes it easier to work them by touch. I am going to do the same in West Lynn, with the 3 already installed for the Middle track, and the left 4 for the east runner. I live in South Hampton, near the ocean and next to Massachusetts. As distances in NH go, Keene is a fair ways - 2+ hours, all on 2-lane roads. But if you visit her, it's a short hop to Bellows Falls and the Green Mountain RR's engine terminal, excursions etc. Despite a couple of trips out of the country, I've got the West Lynn panel wired up and five of the switches connected to their Humpyard levers. I've used Radio Shack 2P6T rotary switches - they're only rated for 0.3A but I don't expect that to be an issue because usually blocks (at least in an industrial area) don't get switched when a locomotive is in them. 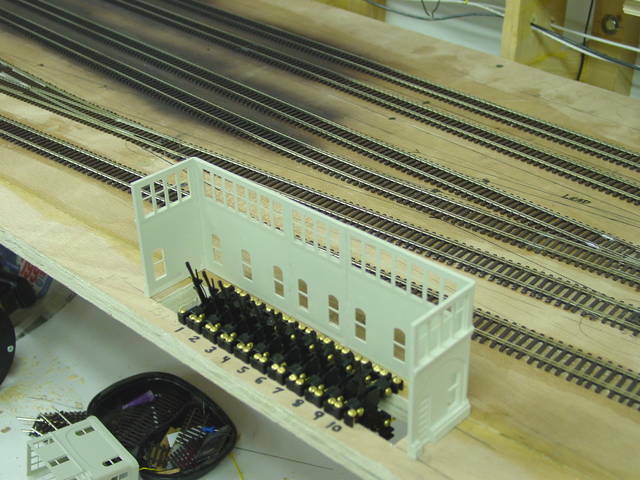 I am using much heavier-duty toggles where locos will be stored. West Lynn is getting to the point where I need to draw and build the framing for the next section, the staging yard that will simulate Boston and Portsmouth. Maybe by Thanksgiving. Wiring, my least favorite part of the hobby. BTW, my brother lives in Brentwood, just a short distance from you. If circumstances ever have you visiting him at Thanksgiving, be aware that the Tour de Chooch (co-ordinated layout open houses from the Boston suburbs to southern Maine) is traditionally the Saturday and Sunday after. This year's layouts (http://www.amoskeagnorthern.com/chooch/Chooch2008.pdf) range from parent/child work to "featured in MR". Recently, my focus has been on structures, but I've finally gotten some onto the layout to photograph: I'm liking the way Railroad St. in Bexley is coming out, but it's taught me why sloping street scenes aren't so common in models. Two of the buildings are DPM, Saulena's is Bar Mills laser-cut wood, the rest were carved out of Walthers' Merchants' Row. The westbound commuter exiting Bexley Tunnel shows something I've been thinking about: The prototype (in Salem, MA) was notoriously tight; it couldn't even handle PRR round-roof steel boxcars. A few years ago, I scratchbuilt a bridge to clear the NMRA gauge, but in 3/4 angle photos, it looms up above my steam-era equipment in a way that leaves me dissatisfied. This portal isn't as small as the prototype - it will clear Plate C, but IMO it looks a lot better. The portal is removable, in case a visitor brings some auto racks. And if I ever have a change of heart about modeling eras, I can build a larger portal and swap them as necessary. Finally, I'm thinking about my engine terminal, and that led me to dig out my Suydam Diesel House to study how the pits were built. It's first structure I ever built (~35 years ago), and one of the reasons I've avoided cardstock in my construction since. It doesn't fit my current layout, otherwise it would be easy enough to pop the old Goo loose, steam-iron everything flat and seal the surfaces thoroughly before reassembling it. Of course, the odds are against me being around 35 years from now to see whether it lasted better. Nice work, James. I have to say that every picture of a B&M layout gives me a bit more impetus to push on with mine - thanks!! Nice progress, James. I really like the photograph of the 1501 exiting the tunnel with the sloped street above. I've seen some scenes like this in my research. Very nicely done! Good to see you updating. Looking very nice!! I look forward to more updates and pics! I'm continuing to work on the west portal area in Bexley. Last week I got the portal's stonework carved, using a carbide-tipped tool I originally bought when I got tired of scoring my 4x8 sheet of .040 with an XActo. One tip is a sharp angle, the other is broader and makes decent mortar lines. This kind of granite masonry is all over New England, and in most places all that's changed is the soot finally weathering off 40-50 years after the end of steam (if somebody tells me the RRs actually painted the stone black, I'll be astonished). Here's the portal in place, with the buildings that go atop the tunnel ready for detail painting (this week's project). There's a good deal of scenery left to do, plus a tunnel lining to engineer, but I think I'll feel rewarded by the resulting pictures.